A stunningly simple spice powder that’s a perfect partner for idlis and dosas. This long lasting, gently spiced coarse powder mix comes in handy either as a standalone side dish with idli/dosa or as a snap dip along with chutneys. Button idlis or chopped idli pieces tossed in this pudi makes for a favourite finger food. Dry fry all the above ingredients separately (in the order mentioned above) in a skillet on medium flame and transfer each of them to a plate. Let it cool thoroughly. Grind them in a mixie to a not too fine powder. 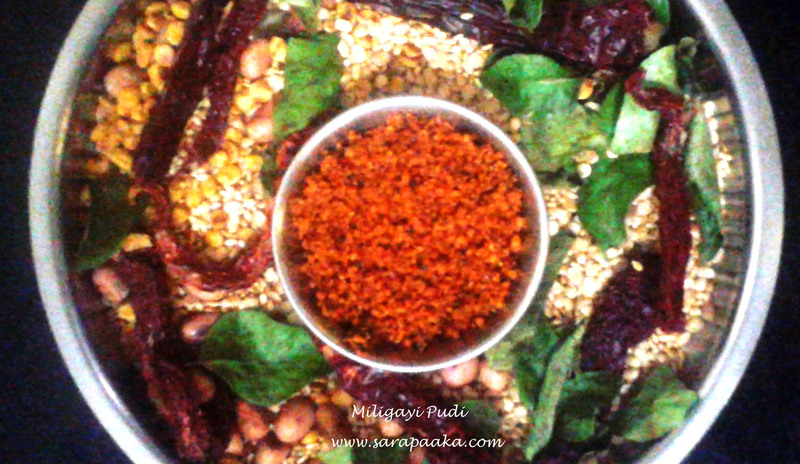 While grinding, first grind dal coarsely, then add red chillies followed by other ingredients. Watch out…sesame seeds may turn out oily and sticky in case of overgrinding. Did you cough in the first round of grinding itself? Wow, you are well on your way to making a great spicy powder! For, that is what a good spice powder makes you do first!! Enjoy the grinding while coughing J! Let the texture of the powder be a bit coarse. Transfer this powder on to a plate. Mix well and spread it on the plate. Let it cool completely. Store it in an air tight container. This powder is a perfect side dish for idli and dosa. Traditionally, it is mixed with sesame oil or gingelly oil or any other cooking oil before serving. To make friendlier idlis for those fussy ones, make a “Quick n Spicy Idli” recipe in a jiffy. Chop the steamed idlis into bite size pieces. Heat oil in a kadai. Add mustard seeds. When they crackle, add urad dal and curry leaves. Add chopped green chillies and idli pieces. Sauté for about 2 min. Toss well while sautéing. Switch off the burner. Garnish with finely chopped coriander leaves. Serve it hot. Groundnuts can also be used in place of til seeds. Bengal gram dal can also be used along with black gram dal, usually 1/3rd the quantity of black gram dal. You can experiment and achieve the taste that suits you. A handful of dried curry leaves, dry fried and powdered along with the other ingredients adds to the flavour of the powder. Kerala version of Miligayi pudi will have few peppercorns added cutting down on the quantity of red chillies. You can add a pinch of jaggery for a tinge of sweet taste and a pod of tamarind for a tangy taste.